I wrote to Catherine on 5 January 2016 and today, 23 February 2016 I got my reply! That is a response time of 49 days up significantly from just 17 days last year… either the offices are getting slower (I doubt it), they have a whole new routine for dealing with mail (highly probable), or more and more people are writing (I’d bet this is true too). 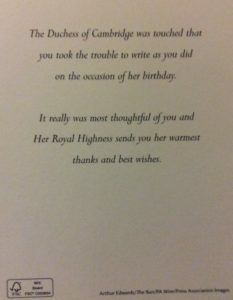 The card this year is the same as the one they mailed out last year, featuring a photo of Catherine on her visit to Only Connect snapped by favored royal photographer Arthur Edwards. As I saw some of my friends get their responses, I was curious as to what i would get when it arrived, not so much the card but the envelope…one of my friends got Catherine’s response in an envelope that matched William’s Stationary and so I wondered which envelope I would get. 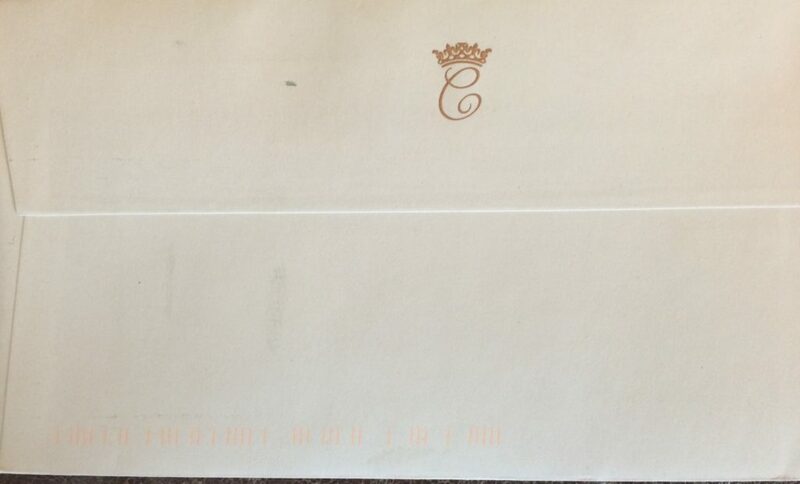 It came in an envelope that matches Catherine’s Stationary…perhaps the Kensington Palace office saw me suggest to my friend that they needed to make note and send Birthday Replies from William in Catherine’s envelopes just to be fair.